Been awhile since I posted a resto or resto mod. So there will be a few coming to this site! 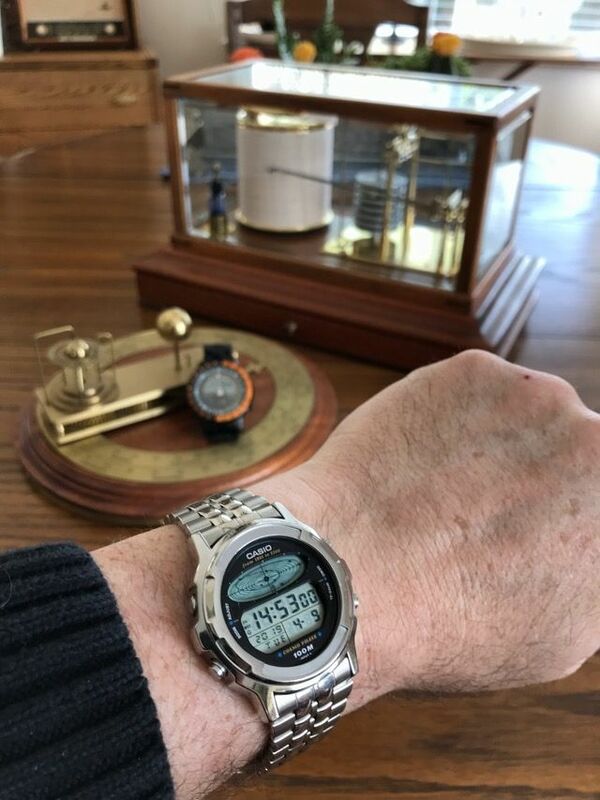 A few years ago I picked up a new old stock plastic version of this watch. 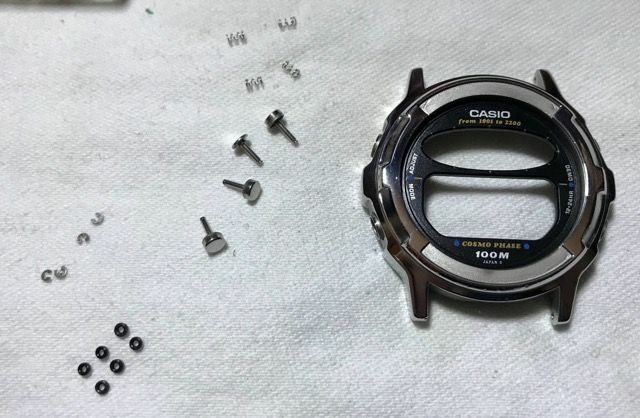 Too bad Casio made so many plated pot steel and plastic versions leaving out the stainless choice. 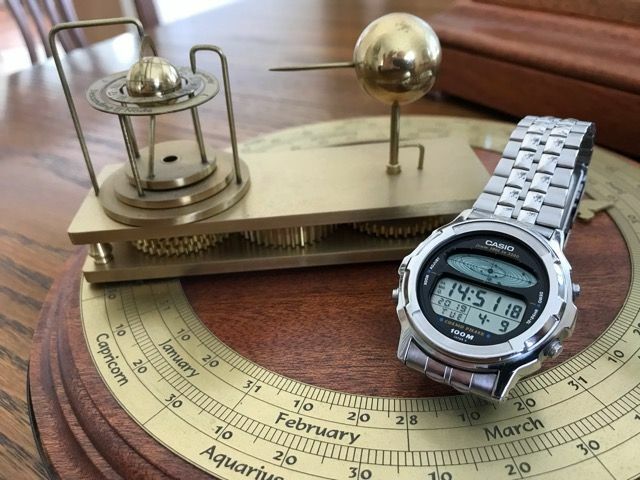 Watches such as the CFX-40 / 400 or the CFX-20 / 200 in plastic and chrome plated pot steel. 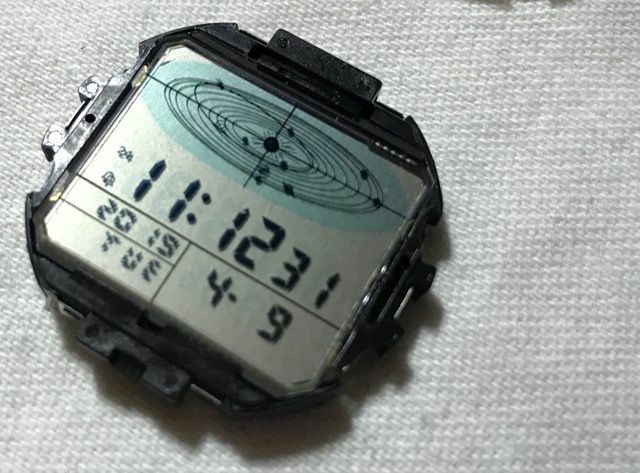 Not many of these watch cases survive unscathed and yet these exceptional modules seem to. You would think the CFx versions would have gotten a stainless steel version. 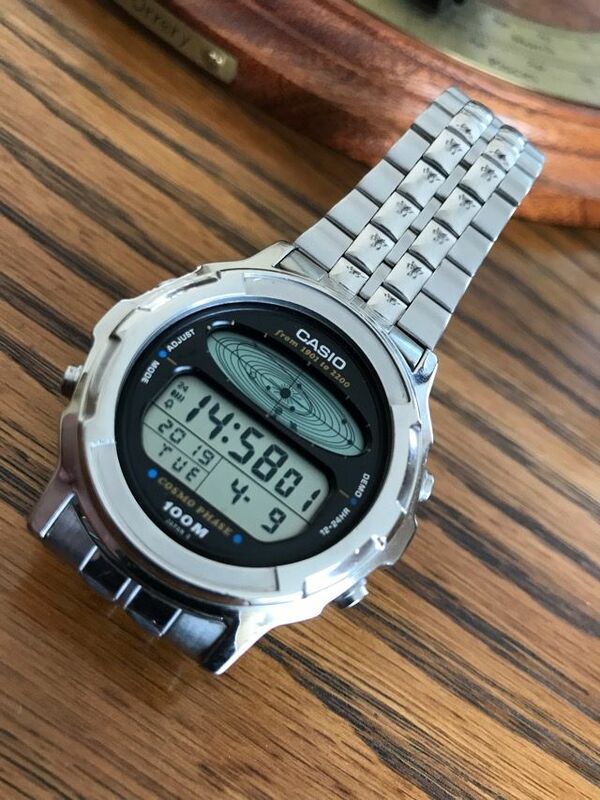 Well I finally got a hold of a Stainless Steel Cosmo Phase 830) which I intend to wear so I did a restomod on it for my wrist! The mod part is the case finishing, I wanted to show off the stainless steel so I mixed up the pitted and scarred case with polished and flat steel surfaces. 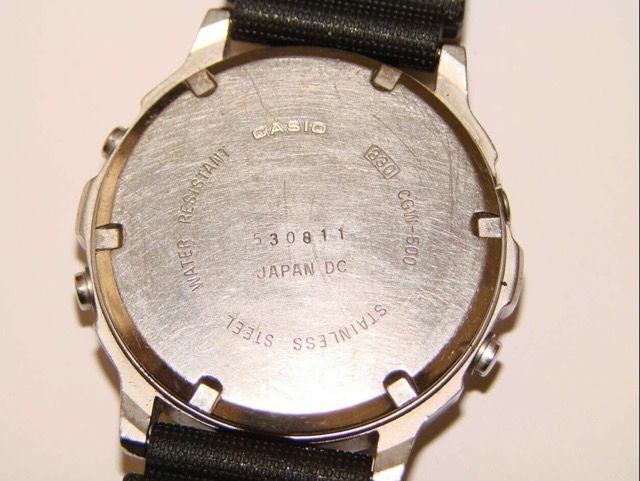 Also the labels which are silk screened on to two semicircular aluminum plates had the writing worn off. I removed them exposing the flat steel finish which contrasts nicely with the gloss polished highlights. So removed the module, crystal and crystal gasket, pusher circlips, pushers and pusher springs. 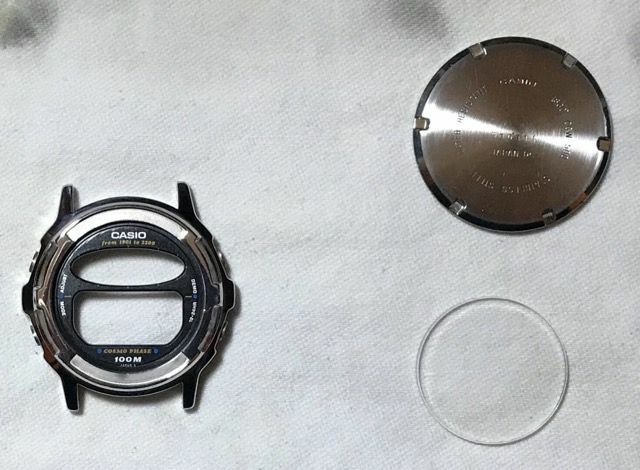 Ultrasonically cleaned all case parts except the dial. I replaced the six pusher gaskets as well as the case gasket. The module was in excellent shape with no corrosion or battery leakage or jeweller scratches. The price was right due to the sandblasted crystal and the scarred case. Module removed with case parts showing. Note the four springs, pushers, circling and six o-ring gaskets. I was wondering with the odd number of o-rings whether someone was in the case before me. I THINK this was factory, any one else taken one of these apart. The two lower pushers require two o-rings for the pusher to seat correctly (flush) inside the case. The two upper pushers do not require two o-rings to accomplish this. Longer springs would correct this but as you can see the springs are all the same length. I have one, but the module just died, as no battery changes makes it work. Ronaldheld have you reset the AC? You probably have but just a thought. Adam wrote: Ronaldheld have you reset the AC? You probably have but just a thought. I thought that I did, but will try again. Yes, that is a surprise when you swap batteries. You would think that it would light up with something. NO, pressing a and c did nothing. Must be dead. ronaldheld wrote: NO, pressing a and c did nothing. Must be dead. Thanks. I never had to have that done.. Could you provide pictures, when convenient? On the back of the module, the battery side you will see the letters AC. This stands for all clear. Simply insert the battery, connect the battery holder in place. Take your tweezers and insert one end into the hole immediately adjacent to the AC and the other end of the tweezers to the positive side of the 2016 button cell. This causes a short resetting the IC. 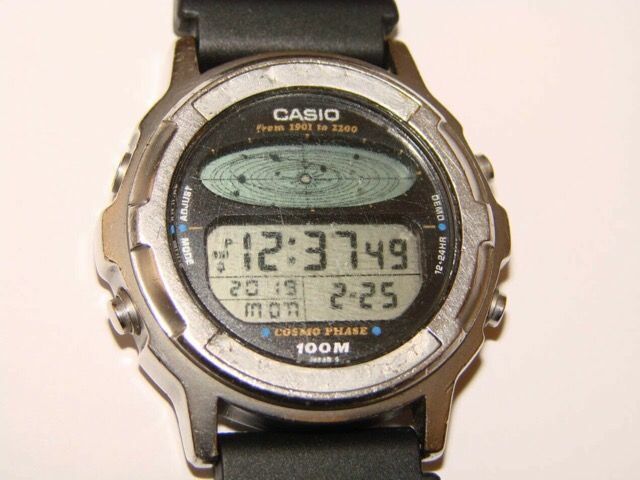 You will get a momentary display of all LCD panels then the time should start ticking at 12:00. I too have the plastic version in NOS condition that was marked ‘not working for parts’. It simply needed the above reset procedure. Always wanted a stainless steel version and now I have one also. In fact I am wearing it now carefully as I am awaiting a new crystal. Thanks Geoff. I will have to get the person who changed the battery to perform this procedure. Sorry Ronaldheld, What Geoff wrote is what I meant. I dont work on newer Casios so only know of the AC reset by shorting the marked AC contact with the battery. Adam wrote: Sorry Ronaldheld, What Geoff wrote is what I meant. I dont work on newer Casios so only know of the AC reset by shorting the marked AC contact with the battery. No problem, Adam. I will report back when I get it tried. Lovely job, where did you get the bracelet?